Stan Lee & Steve Ditko story. Steve Ditko cover & art. This includes CGC, PGX and CBCS graded comic books. Please be aware these items are NON RETURNABLE. 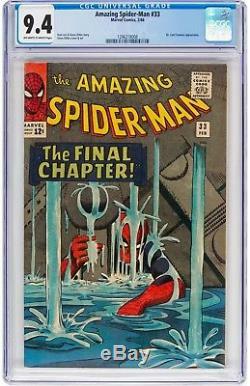 The item "The Amazing Spider-Man #33 (Feb 1966, Marvel Comics) CGC 9.4 NM Dr. Curt Conn" is in sale since Tuesday, October 2, 2018. This item is in the category "Collectibles\Comics\Silver Age (1956-69)\Superhero\Spider-Man". The seller is "gt-cbooks" and is located in Tampa, Florida.